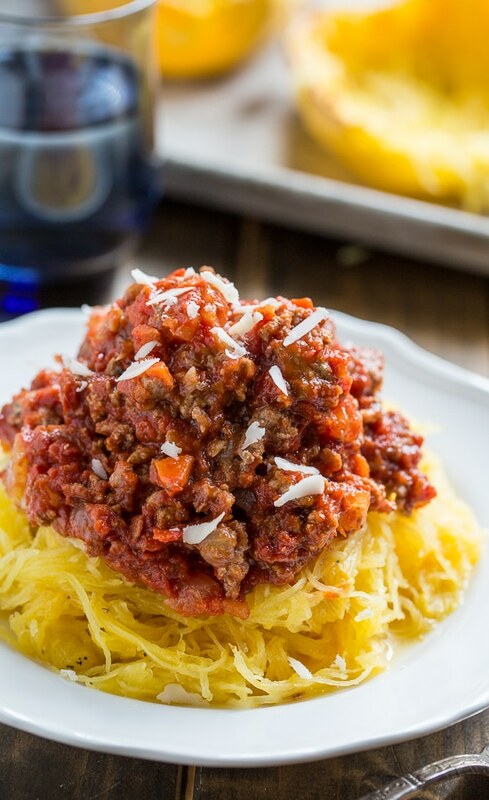 Spaghetti Squash with Spicy Meat Sauce is a healthy, low carb and gluten free meal that still tastes like delicious comfort food. It’s a New Year! Time for some healthy recipes after weeks (ok, maybe months) of eating sweets nearly every day. 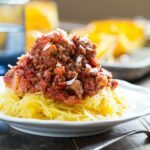 This Spaghetti Squash with Spicy Meat Sauce is a healthy, low carb and gluten-free meal, but it still tastes like delicious comfort food. The sauce is super thick and made from lean ground turkey meat to keep the calories and fat low. To make this recipe as low fat as possible be sure to use ground turkey that is made from all or mostly white meat. Go heavy on the red pepper flakes if you like. Who knows? It may speed up your metabolism. Substituting spaghetti squash for pasta really works for me because I’m partial to the sauce part of a pasta dish. Whatever is underneath the sauce is just something to eat it with. Because I would feel like a weirdo if I just ate a bowl of sauce. If you’ve never tried spaghetti squash as a sub for pasta, you really should. It’s very healthy and really quite delicious. For another low carb meal, try these zucchini noodles. Spaghetti Squash topped with a spicy meat sauce made from ground turkey is a healthy, flavorful, gluten free and low carb meal. Heat oven to 400 degrees. Slice spaghetti squash in half lengthwise and scrape out the seeds. Rub 1/2 tablespoon olive oil onto the cut side of squash and season with salt and pepper. Place cut side down on a large, rimmed baking sheet and cook for 45 to 60 minutes, until tender all the way through. Heat 1 tablespoon olive oil in a large nonstick skillet over medium heat. Add onion and carrot and cook for 2 minutes. Add turkey and garlic and cook until turkey is cooked through, breaking into pieces with a wooden spoon. Season with salt and pepper and add Italian seasoning. Add tomato paste and crushed tomatoes and stir well to combine everything. Reduce heat and simmer 5-10 minutes. Add red pepper flakes and more salt and pepper if necessary. Scrape out insides of spaghetti squash with a fork. Serve topped with meat sauce and Parmesan cheese. Cook the spaghetti squash until tender, but careful not to overcook. It will get mushy. Follow Spicy Southern Kitchen| Christin Mahrlig’s board Healthy Recipes on Pinterest. This entry was posted in Dinner, Main Dishes and tagged gluten-free, healthy, low carb, poultry, spaghetti squash, turkey. Bookmark the permalink. Never Had Spaghetti Squash with Bolognese Sauce Before Sound Yummy, But i Have Made It With Alfredo Sauce was Delicious. Great Post! I never have tried spaghetti squash in replacement of pasta before.. so I am definitely curious to know what it tastes like. In saying that though, this does look incredibly delicious! 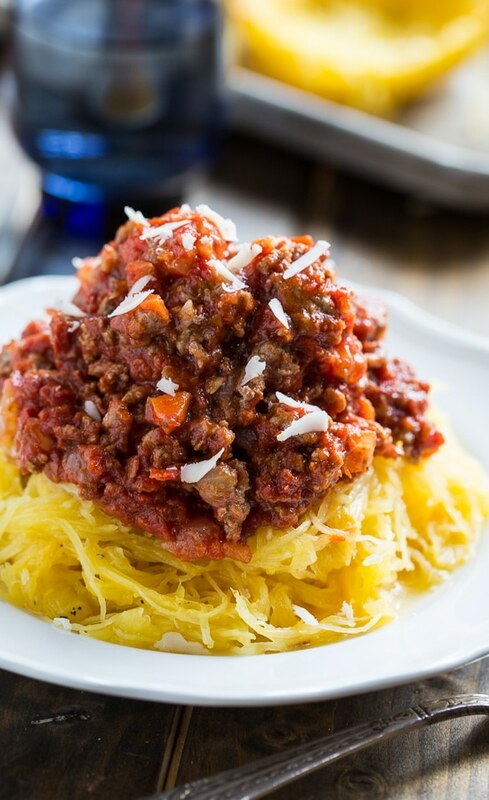 oh my goodness, I love this Spaghetti Squash with Spicy Meat Sauce!!! YES to healthy and low carb!!! this is all I’ll be eating (or trying to) this month! Happy New year!!! way to start it off right!! Beautiful dish and deliciously hearty. I sure wish they shipped spaghetti squash to Hong Kong, well until then I can just gaze at your gorgeous photos and pin them for later. 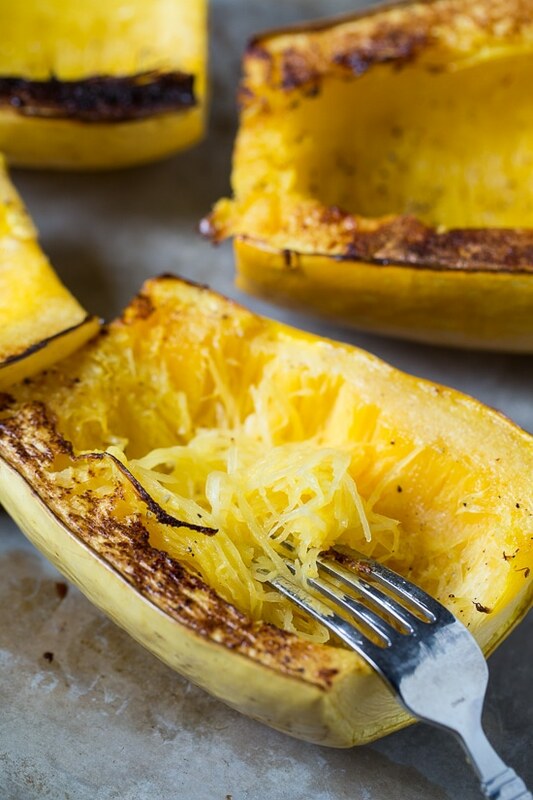 I love that you shared this recipe today because I have been craving spaghetti squash. Topping it off with spicy meat sauce sounds perfect. Happy New Year, Christin! Yessss – I love running the fork across the spaghetti squash! haha It’s so fun! Haha! It like magic! Pop a solid squash in the oven and it turns into strands. It always amazes me. Goodness, that meat sauce looks incredible! I’ll have to eat a few spoonfuls of it to taste beforehand.. you know? 😉 Happy 2015! Your pictures are mouth-watering, Christin! I’ve always wanted to try spaghetti squash and I think I found the perfect recipe! Pinned! I’ve wanted to try spaghetti squash for SO long now! This looks super scrummy and delicious! Love the meatball sauce, so good! I am seriously SO excited to try this squash! 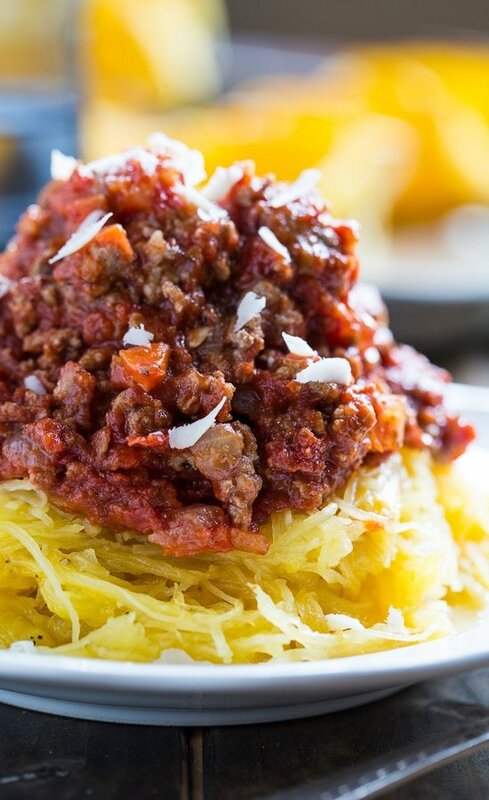 I love spaghetti squash, but never thought to top it with a meat sauce! This is going on our dinner menu. 🙂 Gorgeous photos too, Christin! Happy Happy New Year, Christin! This looks amazing! I am ready for healthier eating after all the sugar I had over the holidays too! 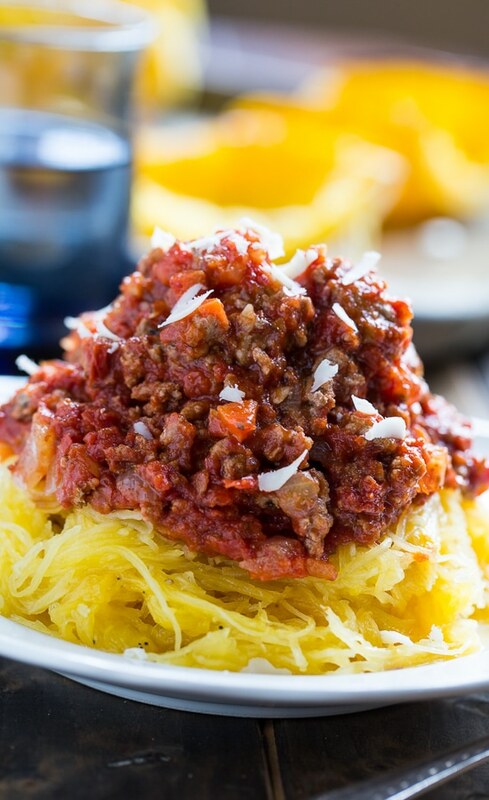 Love that you used spaghetti squash to replace the pasta and the spicy meat sauce sounds perfect! If healthy eating in the new year looks like this, I can totally do it! I can’t believe I haven’t tried spaghetti squash as a pasta substitute, but this recipe makes me want to! Love all of that spicy meat sauce! Happy New Year!